The Yankees had one of their best victories of the season last night, coming back in the ninth inning against one of the best closers in baseball. Eduardo Nunez and Brent Lillibridge drove in the tying and go ahead runs off of Joe Nathan as the Yankees beat the Texas Rangers 5-4 on Tuesday night. The Yankees came back from a deficit on Sunday night in Boston as well, although this time they fell short in extra innings. The Yankees are still struggling to score runs, marked by a stretch of over 20 hits over several games without anything other than a single. 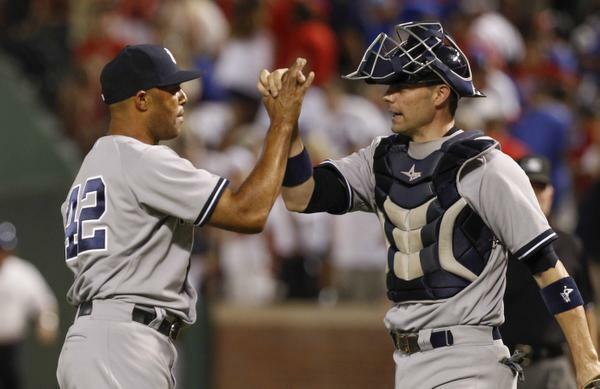 The Yankees pitch great, have team speed, and have on of the best weapons in baseball in Mariano Rivera. However, the Yankees are still seven games back of the Red Sox for the division lead and are looking up at three teams for the two AL wild card spots. The narrative all year has been that if the Yankees get their stars back they will have a chance to climb up the standings, but each time a player comes back or is close to coming back they seem to have a new injury crop up. Whether its Granderson, Teixeira, Youkilis, Jeter, or Rodriguez, the Yankees just can’t seem to get their stars back from injury. This current Yankees lineup has already overachieved by leaps and bounds just to keep the Yankees afloat. But as we watch the Yankees struggle for wins, the question has to be, how much time is left before this is a lost cause?